IVPN offers an interesting mix of power and ease of use, and has a no-logging policy that we can actually believe. IVPN is a small Gibraltar-registered service that has been preserving its customers’ privacy since 2009. The company's VPN network can't match the big players, with just 38 locations across 27 countries. These are focused mostly in North America and Europe, although there are also servers in Hong Kong, Tokyo, Singapore and Australia. Torrents are supported on all servers, in theory, although the company politely asks that users avoid P2P on US servers. Platform support is reasonable, with custom clients available for Windows, Mac, iOS and Android, and detailed setup guides for Android, routers, Linux, some NAS types and more. Whatever devices you've got, IVPN allows you to connect up to five at the same time. IVPN operates its own DNS servers, a welcome extra touch which helps to ensure your online activities can't leak to third parties. A multi-hop feature enables routing your traffic through two VPN servers. For example, you could have the client connect to the VPN in London, travel through the network to New York, then on to the destination website. That website only sees your New York IP address, and even if the New York server is compromised, anyone monitoring it will still only see the London IP address rather than yours. IVPN explains that it holds your email address only, and optionally some form of payment ID, such as a PayPal account name. But you can avoid this by paying via Bitcoin, or even cash, and you can ask the company to delete your data if you close your account. IVPN offers a free three-day trial. You must provide your email address and payment details when you sign up, but as long as you cancel before the trial ends, you won't be billed. A post-signup page asks you to choose your device types. We opted for the Windows client, downloaded and installed it with no hassles or complications. 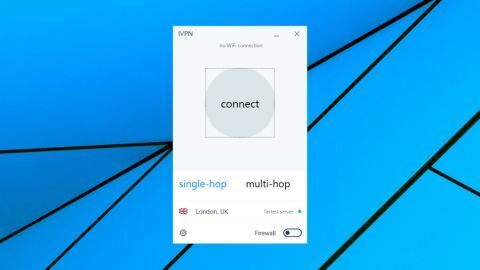 The Windows client looks much like any mobile VPN app: here's a big Connect button to access the fastest server, there's a location list to choose something else, plus a Settings dialog with a pile of configuration options. The location picker is simple, with no extras beyond a ping time to give you an idea of server distance. But there's no favorite system, no search box, no filters, not even a 'last used' list. By contrast, the Settings area is absolutely stuffed with powerful options and tweaks. You can build lists of trusted and untrusted wireless networks and define what the client should do when you connect to them, for instance. The IVPN Firewall is a very configurable kill switch-type feature which blocks non-VPN traffic, and a Connection panel could help you bypass VPN blocking by changing ports or using obfsproxy. Experts can even specify custom OpenVPN switches which will override the client's own settings. IVPN's other significant extra is its multi-hop feature, as mentioned earlier, which can direct your traffic through two VPN servers. You can set this up to define entry and exit servers, for example London and New York. We're unsure how much benefit the average user will get from this, but at least it's easy to use. Click the Multi Hop tab, choose an incoming and outgoing location, and you can connect and use the service as normal. IVPN sells itself very much on privacy and security, and the website barely mentions the possibility of getting access to blocked websites. We logged in to the UK server and tried accessing BBC iPlayer, anyway, but got the standard 'this content is not available in your location' error. US YouTube gave us our first victory, with IVPN allowing us access to US-only content on each of its American servers. The good mood didn't last long, though, as we found IVPN didn't allow us to stream Netflix. A support document explained that although some users might have unblocking success, IVPN makes 'no guarantee about the availability of these services when connected to our network.' The company really is focusing on privacy and security above all else, and there's no commitment here to unblock Netflix or anything else. Our IVPN performance tests got off to a solid start, with our closest UK servers averaging 60Mbps on a 75Mbps connection. Encrypting and re-routing your connection will always slow it down a little, so that's almost as good as you'll get. European servers were almost as impressive, and for example UK-Italy connections ranged from 55-60Mbps. Going long-distance saw more mixed results, with Singapore struggling to 7Mbps, while Australia gave us a more acceptable 20Mbps. Our final privacy tests ended the review on a positive note, as IVPN passed with ease: all our new IPs were in the advertised locations, and there were no WebRTC or DNS leaks to give away our real identity. IVPN's network is relatively small, but the clients are easy to use, with some unusually powerful tweaks and settings, and you're protected by one of the clearest no-logging policies around. It's a likeable alternative to VPNs which make big promises they can't deliver – and the service offers a three-day trial to check it out for yourself.